OMG, I am so in love with this project! I’ve made like four of these for my “Circus of the Damned” Halloween party. They are super cheap and high impact. Plus because they’re battery operated you can put them ANYWHERE! I am hanging them above various party “stations” such as the Drinks table, the Snacks table, etc. I found super awesome free circus fonts to go with my theme, but you could easily change up the color scheme and lettering for a casino night fundraiser or a Vegas themed party. Oooh or a vintage Hollywood theme…or Broadway!!! Sorry, I just had a theatergeekgasm at the thought of a Broadway theme party, lol. Here’s a fun fact for you: Did you know that Broadway (between Union Square and Madison Square) was one of the first electrically lit streets in the U.S.? It earned its nickname “The Great White Way” because by the 1890’s the section of Broadway from 23rd Street to 34th Street was so crazy illuminated by all the electrical advertising signs. Boom! You just got knowledged. You’re welcome. CRAFTING BONUS: Whatever theme you choose, you can just cover the labels with new labels for a different theme and re-use these suckers again and again. Optional: String or wire if you plan on hanging them. Before you start: Open up your LED lights, make sure they have batteries and turn them on to make sure all the bulbs light up. Cut out a shape for your sign out of cardboard or foam board. Once you have your desired shape trace it out on cardboard. Cut it out and spray paint both sides black. It will henceforth be known as the Backing. Set it aside for later. TIP: Well, this is not so much a tip as a confession. I cheated at Step Two. 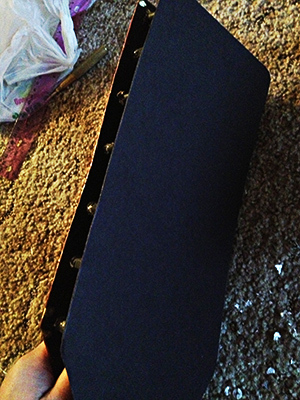 I found a really awesome super sturdy sheet of black paper in the painting section at Michaels. I think it was for watercolor painting…it was about 5 bucks and perfect, but I can’t remember what it’s called. I really did try to find if for you, but as I have mentioned elsewhere, the Michaels website is just about useless- except to find a store and go look for yourself, lol. Count the bulbs on your LED light string. 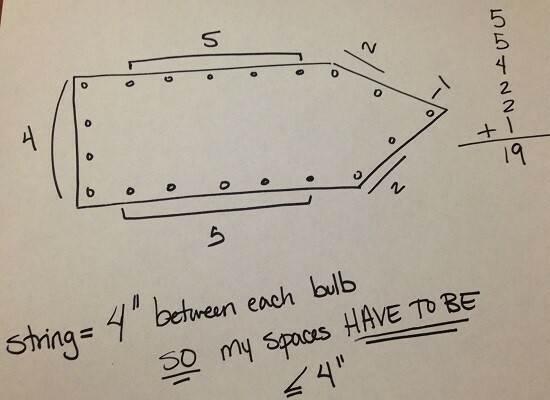 Draw a diagram to figure out how many bulbs per side of your shape. (Most small battery operated strings have about 20, like the ones I used.) for smaller signs you can get away with one string, or use multiple strings for bigger signs. In the end, for my shape I ended up spacing my bulbs about 2-2.5″ apart. 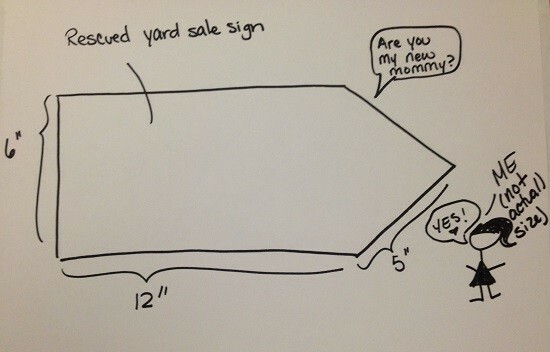 You can get all crazy with measuring if you want, but I just eyeballed it. I’m gangster like that. NOTE: If your shape is using more than one battery pack, you will need a “cup” for each one and bigger shapes will also require more spacers. 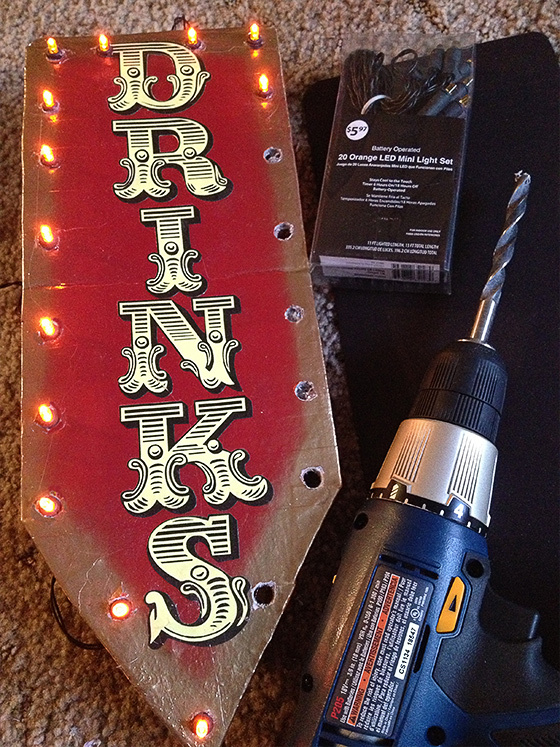 Hot glue your battery “cup” to the somewhere near the bottom of your sign about 1.5″ from the edge of at least one side. 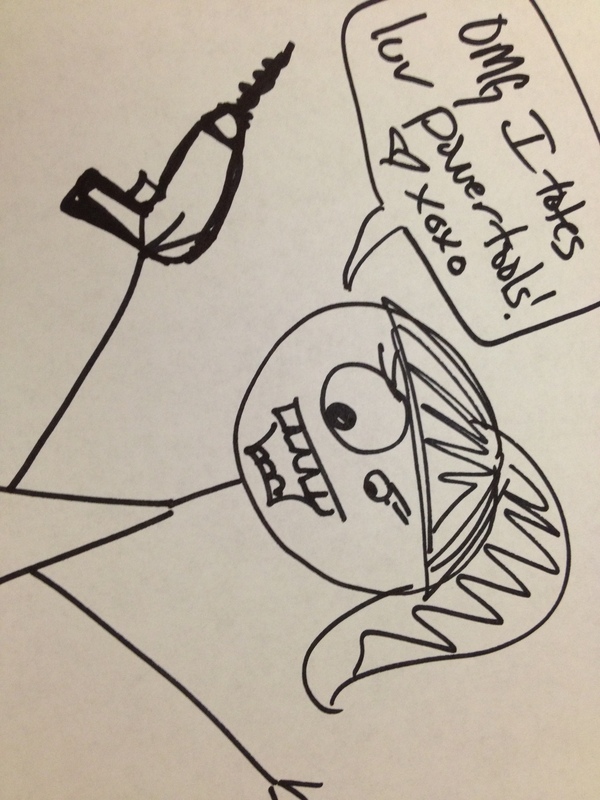 (Doodle 2) This will henceforth be known as the “Front Inside” portion of your sign. NOTE: The battery cup needs to be near an edge because you will need to be able to reach in to pull out the pack to turn it on/off and change batteries when necessary. Remember that you will be putting the Backing on the sign! Spray paint the Front Inside black and let dry. Flip over and paint your sign as desired. When applying your lettering, remember that you need to leave about an inch around the edges for the light bulbs. 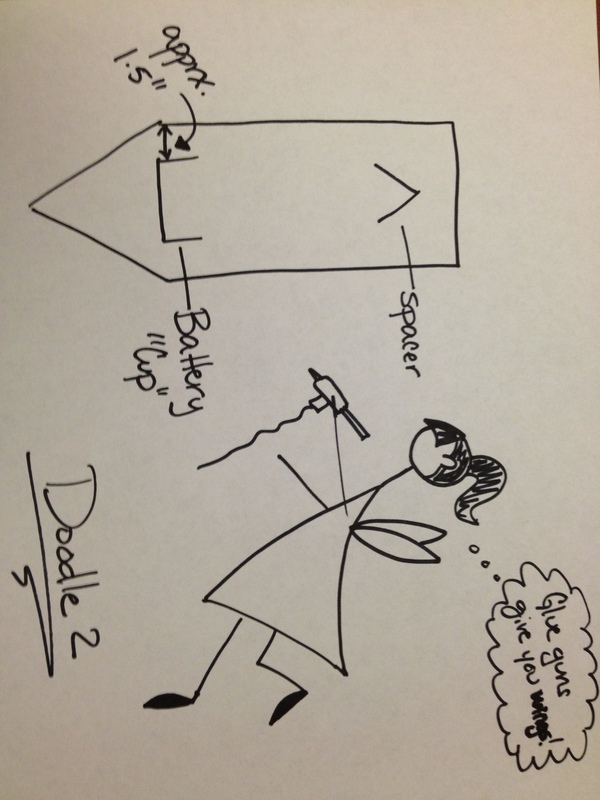 Remember that handy diagram you made in Step 3? On the Front Inside, use a pencil to mark an “x” where you want each bulb. Place your drill point at the center of an “x” and drill baby, driiiilllll! 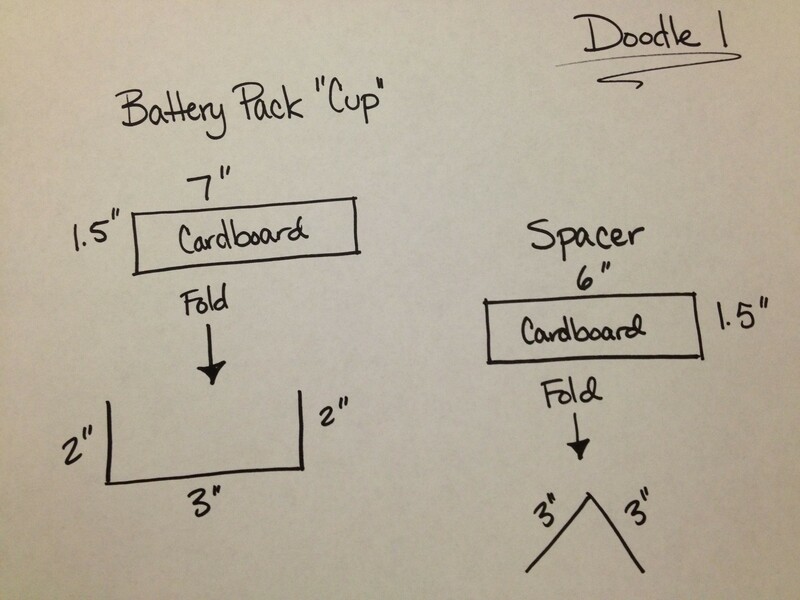 Place your battery pack in the battery cup. Gently insert the first bulb closest to the pack into the closest hole (geez, LEDs are such sluts, right?) so that the widest part of the plastic bit beneath the bulb is visible. About 1/8 of an inch, for you measurement Nazis. Work your way around the sign until all your holes are filled. With bulbs you sicko! TIP: If any of your bulbs seem loose you can use a tiny bit of hot glue around the base to keep them in place. Or just add the glue around the base of all the bulbs just to be sure. Once all your bulbs are in place, use some string or tape to gently pull all the extra cordage between bulbs towards the center so that it doesn’t poke out around the edges of your sign. Apply hot glue to the edges of your battery cup and spacer, line up your your backing and firmly press in place. To hang your sign simply loop string or wire underneath the top. Slide out the battery pack to switch them on and off. Ta-dah! You can see more pics of the signs I made for my circus party on Instagram.